← Over 100 dead in multiple bombings near Russian Syrian bases; al-Qaeda affiliate Ahrar al Sham claims responsibility, leader visited Washington in December – bombings ordered by the CIA and State Department? Senior US commander secretly (and illegally) visits Syria to ‘prepare push to Raqqa’…or finalize Tartus and Jableh bombing? How long can the US keep up this pretense of fighting ISIS? 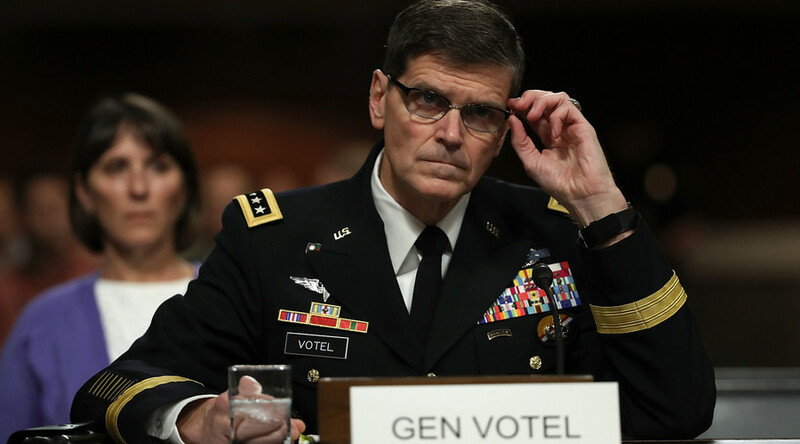 General Joseph Votel, head of US Centcom, talked over cooperation with Kurdish and Arab militant groups while on a secretive trip to Syria on Friday. The talks were said to involve coordinating the US-led coalition and rebels plans on recapturing Raqqa from Islamic State. The news on the highly secretive visit to Syria broke only after Votel had returned to the US. During his 11-hour stay in the country he met with American advisers at a camp, located some 50 miles from the battleground, as well as with representatives of the Syrian groups who are being trained by the American military experts. Votel also talked to commanders of the Kurdish-led Syrian Democratic Forces (SDF). In the aftermath of the visit, Brett McGurk, the US special envoy to the coalition against Islamic State (IS, ISIS/ISIL), tweeted that one of the purposes of the clandestine trip was to prepare an offensive on Raqqa, IS terrorists’ stronghold in Syria since 2013. Commenting on the current positions of the US-backed forces in Syria, Vogel stated that he “left with increased confidence in their capabilities and our ability to support them,” in an interview, cited by AP. The existing model of cooperation between US and armed rebels fighting terrorists “is working and working well,” claimed the general. AP cited Qarhaman Hasan, deputy commander of the SDF, as saying that the talks focused on the issues of US military support to rebel groups in the form of weaponry and equipment supplies. “You can’t run an army on smuggling,” he said, adding that the they are “creating an army” and the necessity to smuggle the munitions severely hampers its operational capabilities. General Vogel became the first military official of such a rank to appear in Syria since the onset of the US military operation against IS in 2014. Vogel reportedly flew to Syria from Iraq on Friday in daylight. Although the circumstances surrounding the flight are not disclosed due to security concerns, it is believed to be the first time US forces’ representatives flew to Syria not under the cover of night. Earlier, it is was reported the SDF is preparing to launch a decisive attack on Raqqa in the coming days. The operation is supposedly going to be backed by US-led coalition forces from air. SDF representative Tackir Kobani said in an interview on Friday that Brett McGurk had visited Syria last week to discuss the “strategy to battle Daesh, in particular, for the liberation of Raqqa, Manbij and Jarabulus.” That makes Votel a second senior American official visiting Syria in the last two weeks. Army Gen. Joseph Votel was appointed the head of the US Central Command (Centcom) in March. The area of Centcom’s responsibility covers Northeast Africa as well as the Middle East and Central and South Asia. Reports of an imminent siege of Raqqa come as Moscow has suggested that the US-led coalition joined forces with the Russian Air Force to strike militant groups that did not adhere to ceasefire plan. In particular, Al-Nusra Front terrorists and convoys of arms and militants crossing the Syrian-Turkish border were mentioned. While the White House has already denied it would even consider a joint Russian-US air campaign, such move would at least partly legitimize the US presence in the country, as the proposal is said to have been agreed with Damascus in advance. The Syrian government has never given permission for any US-led military campaign in the country, making its airstrikes illegal by international law.